← Which Button Size is Right for the Job? Lucky for you, this is a common concern with a quick and easy fix. The main culprit for this type of problem is the mylar slipping on the paper. Oftentimes, this issue occurs when using laser printers and is most prominent when printing dark colors (due to the higher wax content). This can cause air pockets. By reducing the print area by about .125” on both sides of the graphic, you may eliminate this problem. 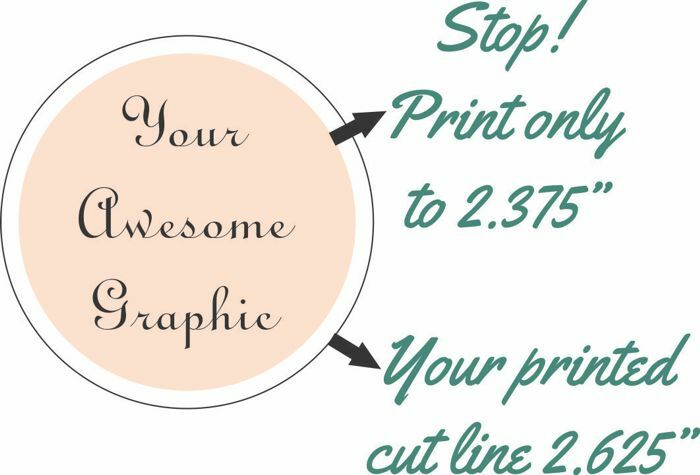 See the graphic layout for a 2-1/4” button example below: A resolution can also be reached by applying a stick lubricant to the crimp die (Tip: if you have a large amount of graphics already printed with a full bleed that you do not want to scrap, this lubrication step may be a solution also). Tecre recommends the Door-Ease Stick Lubricant. If you cannot find this product locally, you may purchase a tube from Tecre for $4.75 plus shipping. Once you have the silicone stick, it can be applied to the crimp die of the button maker machine. Remember the crimp die is in the second die station that holds the back of the button. Place a small amount on your finger (about the size of a grain of rice). Rub it in to the applicable areas indicated below for your round or rectangle crimp die. This needs to be massaged into the die (make about 10 passes) and ONLY applied to the tapered edge. This is the specific area that is causing the mylar to slip on the graphic and to not wrap properly. NEVER use products like a spray aerosol or WD40 on the button machine dies. The lubricant in a tube will prove to be the most effective without dirtying the dies and thus your handiwork. If you have any questions about this or any other concerns regarding your button maker machine or graphics, please feel free to contact us at (920)922-9168! This entry was posted in Button Making Supplies, Manual Button Maker Machine and tagged bad buttons, bleed, Button Machine, Button maker, button maker machine, Button Making Machine, loose mylar, lubricant, machine problems, mylar, mylar not crimping, mylar problem. Bookmark the permalink. My only fear is a grease bleed. I mean even if i rub this in metal is non porous so I just don’t want grease bleed on company / customer buttons that will ruin my reputation of quality. The silicone stick is not grease and if applied correctly, it will not interfere with the quality of your buttons. It does not need be applied after each button. As mentioned above, the best way to apply is by placing a small amount on your finger and then massaging it into the die. It’s also important to apply ONLY to the regions mentioned above which will reduce resistance and allow the mylar and graphic to fold and crimp perfectly into the back of the button. I am making 250 bottle opener buttons with a full bleed BLACK graphic print… Your tip with the silicone stick and where to apply it works PERFECTLY, as the mylar was not crimping nearly tight enough. After applying your little trick, production is back to full speed. Thank you so much for the great tip! We are very happy to hear this worked for you. Thank you for sharing!! !